These air filters are designed for a filtration of 5 micron particles with an efficiency of 95% and above. These are generally used as an intermediate filter to the HEPA filter and pre filter. Generally used for ventilation, air conditioning and air handling units. The media used for making these filter is of either polypropylene, polyester, HDPE, or felt in closed pleats design. Media pack is supported with aluminum tubes. Another design of Mesh supported synthetic media in machine folding to give multiple V pockets are also offered for higher media velocity. 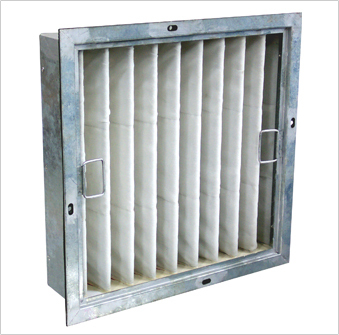 Filter casing, generally, are made out of mild steel, galvanized steel, aluminum or stainless steel. Frames in Box design (also called cassette type) or flange type are available. All sizes not mentioned in the above list are also available on request. Efficiency : More than 95% down to 5.0 microns. Initial Pr.drop : less than 6.5 mm wg to rated airflow. Testing Method : BS 6540, ASHRAE-52.1, ASHRAE-52.2 with AC FineTest Dust.